Morgan James Publishing, 9781630478131, 388pp. The number one issue for financial professionals is capacity. What is the number one way to constantly build capacity in your financial services business? What blind spot is holding you back from achieving more? Does it seem there is never enough time to grow? It's time for you to implement the missing practice management processes into your financial business so you can build your ideal business. Grant Hicks, CIM, is a practice management capacity consultant. In addition to being an author and a popular keynote speaker at many conferences, Grant runs a training and coaching program for top financial advisors. He is the founder and National Director of Practice Management at www.advisorpracticemanagement.com with 27+ years of unique experience in the financial services industry. 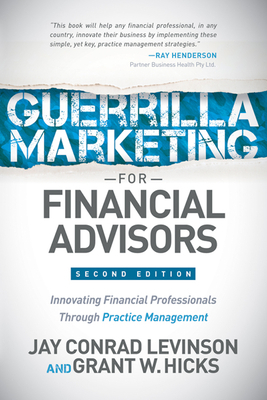 Grant is best known for co-authoring Guerrilla Marketing for Financial Advisors with Jay Conrad Levinson."